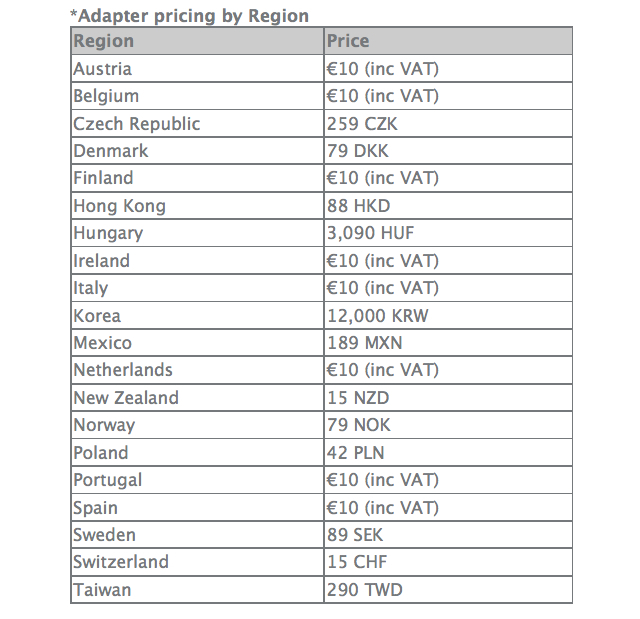 Apple has expanded its USB Power Adapter Takeback Program to 30 countries and revealed adapter pricing by region. Recent reports have suggested that some counterfeit and third party adapters may not be designed properly and could result in safety issues. While not all third party adapters have an issue, we are announcing a USB Power Adapter Takeback Program to enable customers to acquire properly designed adapters. Customer safety is a top priority at Apple. That’s why all of our products — including USB power adapters for iPhone, iPad, and iPod — undergo rigorous testing for safety and reliability and are designed to meet government safety standards around the world. Starting August 16, 2013, if you have concerns about any of your USB power adapters, you can drop them off at an Apple Retail Store or at an Apple Authorized Service Provider. We will ensure that these adapters are disposed of in an environmentally friendly way. If you need a replacement adapter to charge your iPhone, iPad, or iPod, we recommend getting an Apple USB power adapter. For a limited time, you can purchase one Apple USB power adapter at a special price — $10 USD or approximate equivalent in local currency. To qualify, you must turn in at least one USB power adapter and bring your iPhone, iPad, or iPod to an Apple Retail Store or participating Apple Authorized Service Provider for serial number validation. The special pricing on Apple USB power adapters is limited to one adapter for each iPhone, iPad, and iPod you own and is valid until October 18, 2013.